Okay, so, sometimes I write hyperbolic joke headlines, just for fun, in an attempt to make the mundane activities of celebrities even marginally interesting, but not this headline. Not this one. THIS ONE IS 100% BIG NATURALS. Snooki literally wants her little baby Lorenzo to go on a date with little baby North West and then join their two houses eternally in baby-marriage, Lady Catherine de Bourgh-style. LET SNOOKI BE RIGHTLY UNDERSTOOD. "I would love to do a playdate," the Jersey Shore star told me earlier today while she andJWoww promoted season three of Snooki & JWoww (premiering Oct. 22 on MTV). "I wouldn't mind that. I think [Nori] is beautiful. She has Kim's eyes. Kim has pretty eyes." But, Snooki added, "They probably have high standards, though. They probably want her to date a prince or something." We think Lorenzo could be a perfect match. 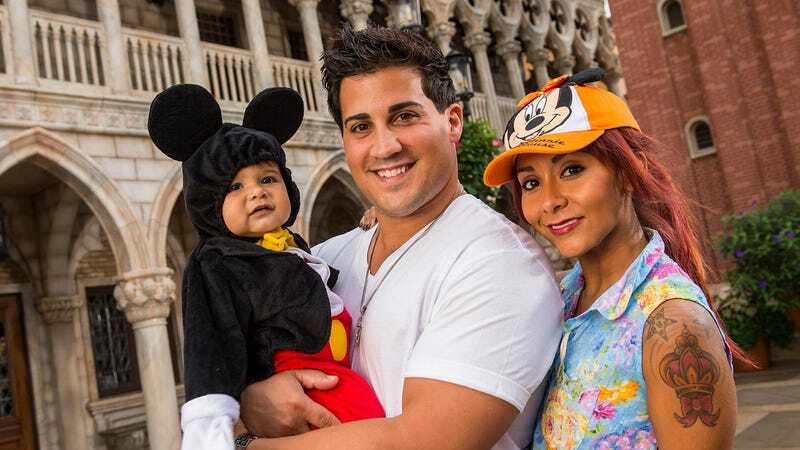 "Lorenzo is a prince—of New Jersey," Snooki said. Start planning the Nori and Lorenzo wedding now! "But no prenup," Snooki said with a laugh. "She wants that Kim K money," JWoww cracked. "Yeah," Snooki added, "I want some Kanye cash." We broke the story ... one of S.B. 's friends — Abrahim Mustafa — was cruising around in the Bentley in January when the car slammed into a motorcycle. The impact sent Gabor Turi flying off his bike ... causing some pretty nasty injuries ... and the Bentley sped off into the Hollywood darkness.Cops didn't make an arrest until May ... after a friend of Turi's nosed around the site of the impact and found a valet at Roscoe's Chicken and Waffles who ID'd the Bentley and knew Soulja owned it.Here's the problem for Soulja. In California, the owner of a vehicle who gives someone permission to drive is responsible when the driver screws up. Thus the lawsuit. Katy Perry and John Mayer are "very serious" and "a source" says they're prolly gonna get nuptialed ASAP. Katy Perry and John Mayer's relationship may be the dark horse to watch out for when it comes to the celebrity race to the altar. The artists are "very serious" about each other, a source tells E! News, and we're hearing that those close to the couple wouldn't be surprised if they got engaged in the not-so-distant future. We know that Perry thinks the world of her beau, calling him a "genius" in an interview withBillboard last month and dishing on his bedtime crossword puzzle habit. If you thought "Neil Diamond Week" was a joke, think again, goofball.